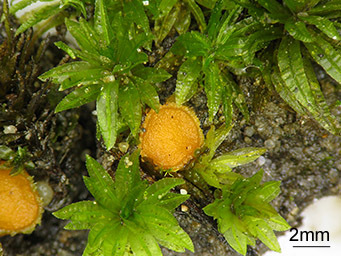 Neottiella albocincta (Berk. & M. A. Curtis) Sacc. 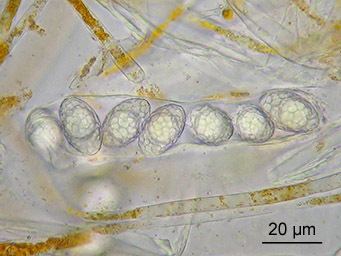 Ascospores: ellipsoid, 19-23(-24) x (11-)12-14 µm, ornamentation consisting of ridges 0.3-1 µm broad forming an more or less regular reticulum. The ridges are often discontinuous to various degrees. In extreme cases the ridges can be reduced to isolated warts. Benkert, D. 1987c. Neottiella atrichi (= N. catharinaea) in Europa. - Beiträge zur Kenntnis der Pilze Mitteleuropas 3: 407-411. McLennan, E. & Halsey, F. 1936. Additions to the Australian ascomycetes, III. - Proceedings of the Royal Society of Victoria New Series 49: 51-61, plate II.